Havings pets at home is amazing, but you know what's even better? Taking your pets to work. Because the most boring, annoying, and inescapable part of your life is far better with a relentlessly optimistic, fur-covered beast derping around. And to aid you in minimizing your time away from your best, furriest friend, Wellness Pet Food has released its ranking of the pet-friendliest companies in the country in honor of Take Your Dog to Work Day. As Wellness explains, "51% of millennial pet parents say they would consider a career change for a pet friendly workplace, and 37% of pet parents would sacrifice benefits (vacation time, work from home days, etc.) if their workplace would become pet friendly." If this list is any indication though, you may not have to sacrifice any of those things. You just have to work at one of places. Check out the full ranking for more details, but we can all agree that hanging out with your dog at a vodka company sounds like a real win-win. 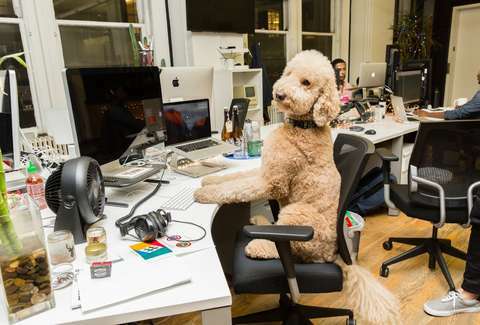 While you may not work at one of these companies (yet), you may in fact be able to hang with your dog at work this very Friday, as it's Take Your Dog to Work Day. Keep in mind that just because it's Take Your Dog to Work Day doesn't mean it's your God-given right to show up with an Irish wolfhound and demand a desk and an iPad for him. You should probably ask, but there's a good chance Sparky might be your intern for the day. This most delightful of days was started back in 1999 by Pet Sitters International (PSI), an organization which not only exists but is an educational association for professional pet sitters. The idea is two-fold: 1) dogs are super-great and 2) this will hopefully promote adoptions for them. It happens every year on the Friday after Father's Day, which is June 22 in 2018. And if it turns out your employer won't let you bright your dog in, well, you have the list above.